Chikamachi Lounge is a group of European-inspired and Asian eateries in a passageway linking the Midland Square building with the Winc Aichi conference center in the Meieki (Nagoya Station) district of Nagoya. Chikamachi Lounge links another passageway in the Marukei Kanko Building and the basement of Winc Aichi to offer a variety of places to eat and relax in a pleasant environment after a day's shopping or time in the office. These restaurant-lined walkways have an Italian restaurant, il Bamboccio, a Spanish-style bar, Vintae, serving omrice lunch sets, along with raw ham, tapas and pintxos, a "British-style" pub, called Strawberry Pudding and Beer Bar La Maison, serving western-style Japanese food (yoshoku) including some rich and healthy-looking beef and vegetable stews washed down with beer or wine. 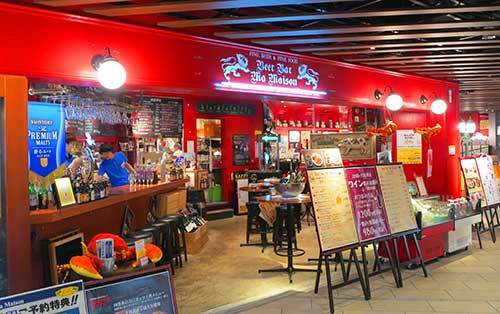 Other eateries in the passageways offer Chinese, soba, yakitori fried chicken and ramen. There is seating "outside" (though you are underground), some stylish black and white coin lockers (in Winc Aichi) to store your luggage if you are catching a train from Nagoya Station and an enclosed smoking area.